This piece was originally a part of an animated short , Monkey and Robot's Flying Circus, created by Ken Gray and Mars Elliot. I worked as the lead modeler on the project, organizing many environments for the short, as well as model out a variety of props. 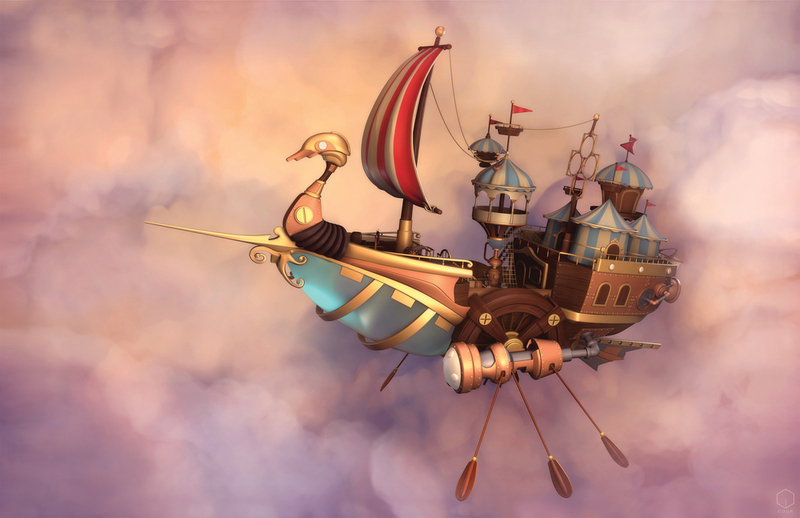 The Airship was kind of the prized goal for finishing up the other environments, but sadly, in 2011 the short went on hiatus. I didn't want the project to end there, so I decided to contact the original concept artist, Eve Skylar, for permission to use her concept for my reference. It was too cool of a design to slide past me. I then began to research the circus, aircrafts, flying ships,steampunk genres and began combining ideas together. As you can see in the final model, I adjusted proportions of the body as well as move parts around, built in a deck with props, and added in more details. 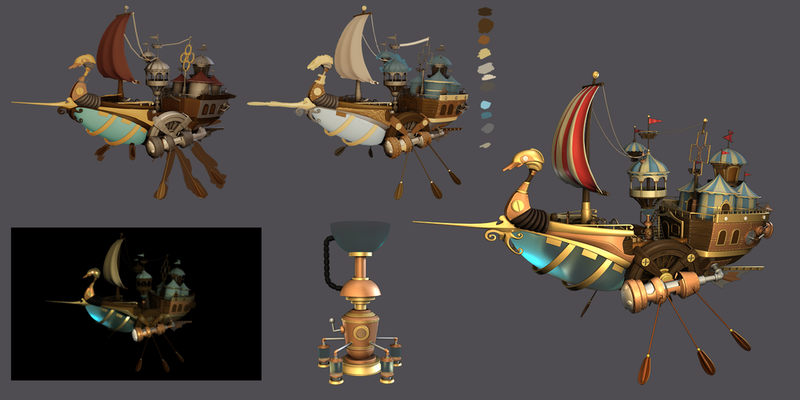 And to add some asymmetry I decided to add in ideas of how characters would travel from point A to point B of the ship. Areas like the trampoline, the rings, the ropes, cannon, and ladders. Of course after that it wasn't finished until I comped/painted the background, and made heck of a lot of color corrections,as well as adding in some atmospheric fog. I also had several back and forth critique emails with Eve. And once it was finally done, I was pretty awestruck when I saw it. I made a fun blueprint layout of it for print. Just because I thought it be cool to show off my model in a different way. This piece definitely pushed my limits of modeling. Areas I had no idea how to model proved to be incredibly difficult, but allowed me to learn how to plan out irregular stylized shapes for future models. Especially the center body, and the head. Also, it had been so on and off throughout the years that my eyes just kept wanting to change and update the model continuously. I decided at one point during all of it, that it was good enough and then painted it and released it for the public to see. It has been one of my most favorite 3D models to ever create, and it was a hell of a lot of fun. I still hope one day that this short will finally come back from hiatus.